Reader Question: Why Did We Go Custom? Now tell us why you opted for a CUSTOM everything in here versus getting a high end vanity/sink/top combo from a big box store and calling it good? Those can look amazing, too. Is it truly worth the added labor, expense, etc to go custom? It looks great but so would something else? I understand you were working with CRAZY stuff here, had to work around returns, etc…but STILL. For a flip? Custom? SPILL THE DEETS! We’ve actually opted for custom cabinetry more frequently than we’ve chosen off the shelf. I know that sounds crazy – I mean, isn’t custom cabinetry supposed to be reserved for people with Scrooge McDuck money? Here’s a little breakdown of the factors we take into consideration when we’re deciding to spring for custom cabinets or buy off-the shelf! 1. … when you’re working around existing, quirky details. 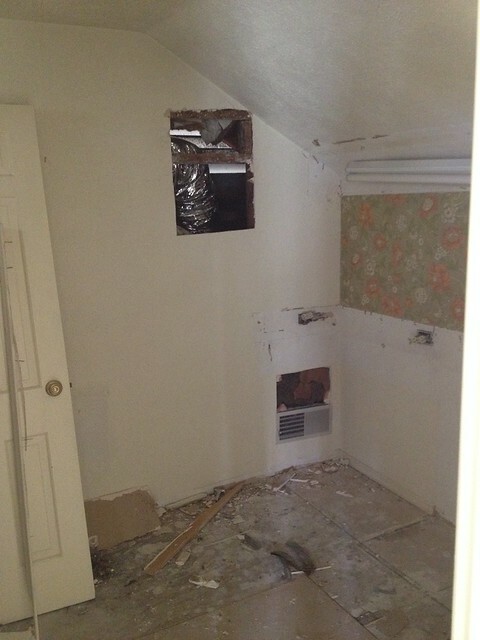 Our current flip has some of the quirkiest, and sometimes downright oddest, details that we’ve ever encountered. 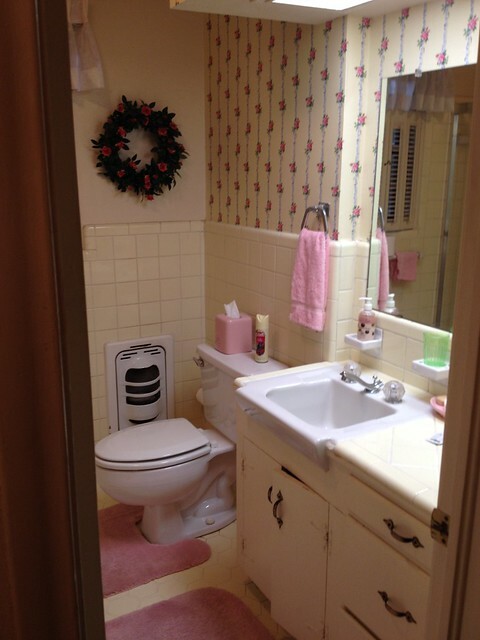 For example, take a look at the guest bathroom – it looks like a pretty straightforward, cosmetic remodel, right? Huh? What is that weird triangle-shaped obstacle on the right? 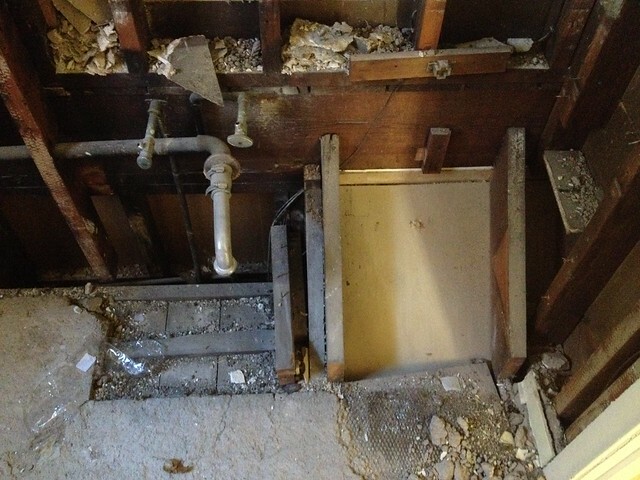 Turns out that a short flight of stairs on the first floor of the home causes this strange bump-out under the vanity. Which means that any store bought vanity would have to be extensively modified to accommodate the bump-out, adding significantly to the cost of the store bought vanity and possibly compromising function. Since we planned to run the vanity along that back wall, the angled ceiling meant that the far right side of the vanity couldn’t be used for anything where the vanity-user would be standing…like pretty much everything, from brushing teeth to washing face to gazing in the mirror. So, it seemed like a good use of space to add a sit-down vanity (for makeup, doing hair, ogling whomever’s using the shower) where head clearance wouldn’t be an issue. The final draft of the cabinetmaker’s drawing takes full advantage of the space that we had, while minimizing the oddness of the slanted ceiling. If we had bought an off-the-shelf vanity, it wouldn’t have been long enough to fill up the wall space and it wouldn’t have been able to solve the issue of the slanted ceiling. That fact alone made our decision to go custom pretty easy. 2. … when off the shelf isn’t THAT much cheaper. There’s no doubt that pre-made cabinetry is almost always cheaper than custom cabinetry. But when you really compare custom to pre-made, the price difference isn’t always that staggering especially when you take into account that the custom pieces fill all of your needs perfect (while pre-made cabinetry often doesn’t). 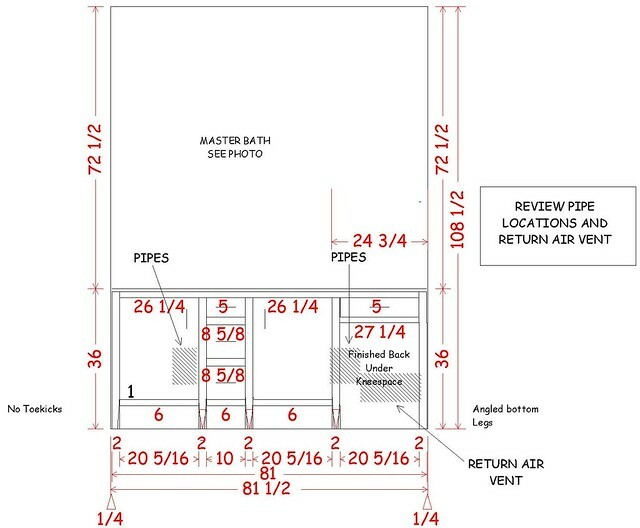 For example, the unfinished, custom vanity that we bought for the master bathroom cost $1,109.61. 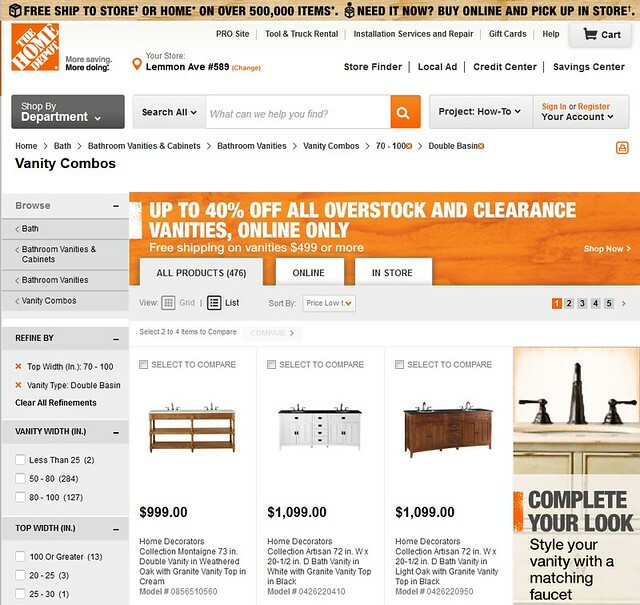 Not chump change, but also not mind-blowingly expensive when you consider that the cheapest double vanity from Home Depot costs $999 (in the 70-100″ category that we needed). 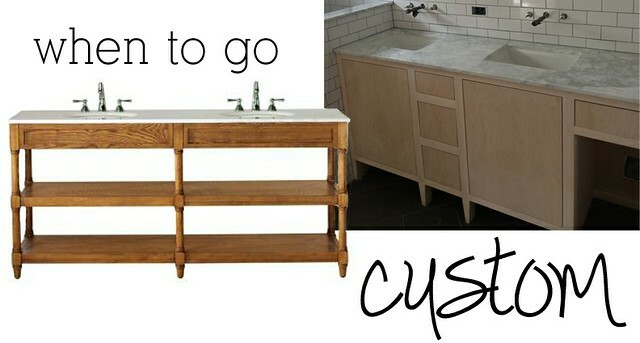 When you take into account staining our custom vanity, adding a countertop and two sinks, we probably sunk in another $700 into our master vanity. Again, not chump change, but also not mind-blowingly expensive when compared with cheapest the off-the-shelf option from Home Depot. 3. … when it makes sense for your project. You can’t cut corners at every single turn and wind up with a finished product that you’re happy with. Sometimes you need to add something really special to elevate everything else that you’ve done. 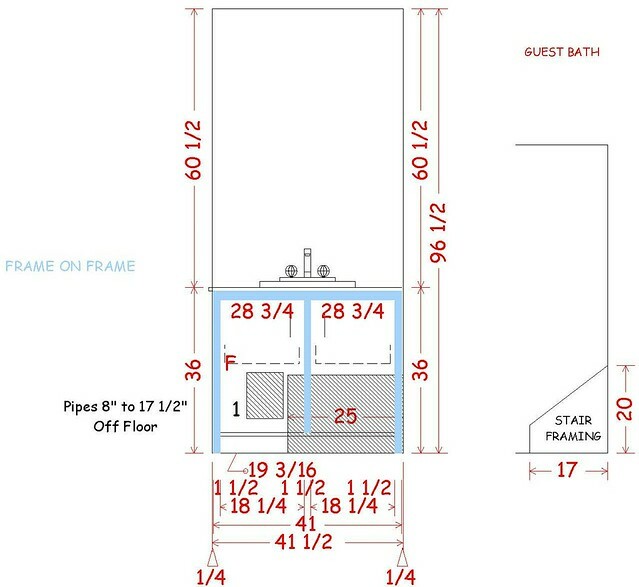 This formula has allowed us to create some pretty spectacular bathrooms (and kitchens, etc.) when the foundation of the room is really inexpensive (think subway tile, sinks from a store that sells “seconds and surplus” building items, etc.). That doesn’t mean that you have to splurge on custom cabinetry, or custom anything, at every turn – sometimes that just doesn’t make sense for your budget, or for the potential resale value of the house. But in our case, buyers in this neighborhood and price range are going to expect some pretty nice finishes. Also, we are able to re-use the existing kitchen cabinetry at a huge cost savings. So, in the case of the master bathroom, we justify the extra $800 we spent for a completely custom vanity for a few reasons: (1) we also got a makeup vanity out of the deal, (2) every detail of the vanity is exactly what we wanted (including the countertops), (3) the vanity works with our angled ceiling and takes advantage of the full wall we had available for cabinets, and (4) I think the master bath (and bathrooms/kitchens in general) is a place where it’s okay to splash a little money around, even in a house that’s being flipped. An extra $800 in the grand scheme of a renovation isn’t the end of the world, and this snazzy vanity is likely worth an extra $800 to a potential buyer of this home. So that’s my two cents on the great debate – what has been your experience with pre-made versus custom cabinets? Oh my gosh! That was a lot of details and comparisons for you to master. I will be SO happy to have someone else figure out those enigmas. I have gone custom before, but has been disappointed when I did not EXACTLY describe what I wanted and the carpenter was trying to read my mind. My fault. I think home remodelers should cross stitch your sentence: You can’t cut corners at every single turn and wind up with a finished product that you’re happy with. I think you are so right, and this is why your flips are always wonderful! Looking forward to more photos of progress. That is all very good information. I agree that it is worth the time to figure out all your options and make sure of costs before making a choice. Your homes always look so beautiful, you are so good at this! Great info and thanks for sharing! 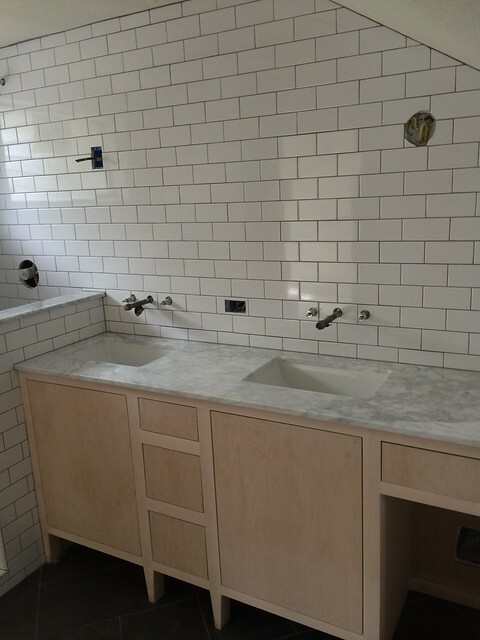 Is your vanity top marble or granite? Also, do you have a “go-to” favorite? Hi Kate! All of the counter tops in this house are carrera marble. When we first started flipping houses we were into travertine or crema marfil marble, but with the gray trend that has taken hold these days we tend to stick with carrera or (a new favorite) volakas marble for bathrooms. In our recent kitchen remodel we found that the Home Depot cabinets wouldn’t save us much money. We had a number of oddities including a chimney and sloping ceiling from a stair. We were also able to tack on a set of drawers in an adjacent under-stair space for our mud room, awesome!! The custom cabinets hide the wacky angles, make the best use of our limited space, plus they are made of MUCH better materials. I don’t like walking through an open house where it feels like someone walked into a big box store and pulled everything off the shelf. Things feel inexpensive and generic. I’m not saying that someone skilled can’t pull off a HD reno and make it look great…HD has some nice stuff and I’m sure it can be done. I’m just not that girl!! Your flips look classy and you clearly know your audience for a given neighborhood. I haven’t seen you use quartz counter in any of your flips. I’m curious if there is a reason. As for quartz counters, I’ve really been wanting to use them – but I’m having a hard time finding affordable options here in Dallas. Part of the issue (not that it’s a bad thing!) is that we get a killer deal on natural stone through our fabricator that is really hard to beat. But when the right opportunity comes up I’ll be all over that quartz! I have tried custom work but that did not went the way I wanted and I was very disappointed . After that I decided to go for only pre made material. I guess for getting a good custom work it depends a lot on the carpenter skill. Custom work always works for me. I always get it the way I want. I was curious to know if you have ever installed IKEA cabinetry in your flips? If so, what were your thoughts on it?